Paper and paperboard will continue to play a vital role in the evolving global packaging market according to the latest exclusive research from Smithers Pira. Overall growth in dollar value terms for packaging was depressed for the years spanning the middle of the decade– although this is largely attributable to relative strength of the dollar against other currencies across that period. Still in 2017, value reached $851.1 billion, a 2.8% growth compared to 2016 at constant prices. This steady expansion is forecast to continue across the next five years – rising slightly to 2.9% year-on-year across this period – to reach $980.4 billion in 2017. The continuing trend towards large-scale mergers and acquisitions – for example the creation of WestRock from MeadWestVaco and RockTenn – is testament to the relative maturity of the packaging industry in developed world regions, like North America and Western Europe. The analysis in the new Smithers Pira report – The Future of Global Packaging to 2022 – indicates that emerging and developing economies will contribute just over 70.0% of world packaging consumption growth during 2017–2022. Asia is the largest market accounting for 42.1% of world packaging consumption in 2016. North America is in second place accounting for 24.3% of world packaging consumption, ahead of Western Europe with 18.4%. The emerging and developing regions of Eastern Europe, South & Central America, the Middle East and Africa account for the remaining 15.2% of world packaging consumption. Asia is forecast to grow packaging consumption at the fastest rate, led by China and India. This is largely attributable to growing populations, rising disposable incomes, and a transition from traditional markets to the purchasing of packaged consumerist goods, especially in the food segment. China alone is forecast to represent almost 48.0% of world packaging consumption growth through to 2022 with India accounting for a further 8.5%. 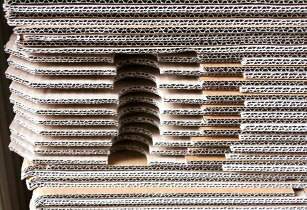 Board and paperboard (corrugated, folding carton stock and liquid paperboard) is the largest packaging material type covered in the Smithers study. It accounted for 35.7% of world packaging consumption in 2016, followed by flexible packaging (plastic, paper and foil) with 23.3%, rigid plastic packaging with 18.2% and metal with 12.2%. Pulp and paper is represented in the two largest packaging material segments – board and flexibles – in 2017. Flexible packaging is forecast to grow consumption at the fastest rate through to 2022, driven by advantages in lightweight, demand for smaller more convenient packaging and improvements in design. Growth will be strongest for flexible plastics which are already two third of the market, but flexible papers will perform only slightly less well across the five year forecast, with aluminium seeing the smallest boost, as pricing and improvements in competing barrier materials squeeze its share. While flexible paper packaging has been under threat from flexible plastics in some applications, it will remain an important constituent of the flexible packaging market for the foreseeable future. This is due to a combination of factors, its low cost, its perceived good environmental credentials, its use in laminations (often as a light barrier), and because consumers enjoy the tactile effect. A number of plastic films have been modified to mimic the feel and look of paper, while offering the benefits of moisture barriers inherent with plastic films. Matte finish BOPP is an example of such a film. Papers continue to dominate some packaging applications, such as flour, sugar and some soft cheeses. Papers are still used widely in medical packaging; fast food wrap and metallised paper cigarette bundle wrap – as well as less formal developing world retail sectors. Dried food, processed meals and savoury snack markets present growth opportunities for extrusion-coated papers, along with speciality medical packaging papers. Corrugated packaging companies are putting increased emphasis on shelf-ready packaging that significantly reduces the workload for unpacking and displaying products. This trend is now deepening with the rise of discount retailers – such as Aldi and Lidl in Europe – and convenience store selling, which are more likely to use less labour intensive shelving options and have fewer of their own branding priorities. This presents an opportunity for the brand to determine how their product is presented in store and gives an opportunity for them to invest in printed graphics for on-shelf differentiation. Press builders like HP are collaborating with specialists in corrugated board handling to develop a new generation of high productivity inkjet press for printing boxes. Source: HP. This trend dovetails neatly with the wider availability of inkjet printers for corrugated board, giving brand greatly expanded options for versioned packaging, including bespoke designs of corrugated formats for short run promotions. Flatbed inkjet systems have been available for corrugated for several years, but productivity and cost have limited these; often to point-of-sale displays, rather than packaging. Across 2017-2022 this situation will change as a new generation of high productivity inkjet presses – like the HP T1100S – especially designed for volume corrugated print are already seeing their first commercial installations. The unspectacular, if steady, rise in demand for packaging in retail outlets contrasts with that in the e-commerce segment. The value of packaging demand into this sales channel was $28 billion in 2017, and will more than double by 2023. Over 75% of this is for corrugated formats, causing a surge in demand for fanfold for fit to packing applications, new designs for returnability, and lighter weight flutings that minimise the size of postal shipments. From a packaging designer’s perspective with a customer encountering their goods away from a shop, serving staff and, other prompts such as point-of-sale displays; packaging is taking on an increasing important role as the primary touch point for brand identity. This is generating interest in new designs that create an opening or ‘unboxing’ experience. E-commerce shipment places a premium on both protection and message communications on brand packaging. Source: Lil Packaging. Folding cartons will also benefit from the digital print revolution. New dedicated inkjet platforms are joining toner based system in this segment, which has been targeted as the first by Landa Nanography with its B1-format S10 press now in beta testing in Israel. Liquid packaging board consumption is likely to be maintained over the next five years. With 70% of this market used in dairy and 20% in fruit juices it will benefit from the healthy eating trend in developed markets, combined with growing consumption patterns in the emerging markets. Liquid carton producers are also responding to consumer demand for packaging suitable for on-the-go drinking. Tetra Pak launched two portion-size packages in April 2017 to meet growing demand for on-the-go beverages. The Tetra Prisma Aseptic 200 and 250 Edge with Dreamcap 26 build on the success of the Tetra Prisma Aseptic 300ml, which has more than 100 customers and packages more than 340 brands. Tetra Pak forecasts that worldwide demand for portion packages under 250ml will grow to 72 billion litres by 2019, up 10% from 2016. Do Shrink Sleeve Labels Drive Consumer Buying Decisions? Using shrink sleeve labels, brands can utilize the entire container of your product as an effective method of showing it off. This allows your product to have more displaying space on a supermarket shelf and a greater chance to attract customer attention. The buying process normally consists of requiring awareness of the product, recognizing it, searching for information related to it, evaluating it, judging alternatives, making decisions, buying it, and then re-evaluating it. These steps have been well researched by professionals including marketing and sales experts. Since shrink sleeve labelling allows more space to show off as compared to normal products, marketing departments use it to the fullest. They incorporate shrink sleeve designs with intricate and dense graphics, a plethora of information concerning the product, and slogans to attract attention. Using shrink sleeve labels for products not only catches the consumer’s attention, but also provides them with knowledge about the product. This ticks most of the checkboxes on the buying process list. Using shrink sleeve labelling, you can display the special features your product has. Displaying just what makes your product special and different from the rest is the best way to gain a consumer’s interest. With that knowledge readily available, the consumer does not need to spend extra time finding out what your product consists of. Furthermore, you can display information targeted at a specific audience. For example, “No Dairy Products Used” can be a good and effective method of attracting vegan customers. If your product matches the description provided on the sleeve, you can gain the trust of a consumer. This attracts the customers towards purchasing other products in your inventory and make them a brand loyal consumer. If you keep delivering to what you promised, your customers are bound to keep buying while telling other people about you as well. It is a win-win for both the company and the customers. Shrink sleeve labels are one of the most important and effective ways to market products and ensure that you get a good audience from the customers. Because of the points detailed above, shrink sleeve labels do influence buying decisions and can be a great asset to all companies competing in retail stores. What’s causing a shift from traditional materials to flexible packaging types? Consumer, retail and technology trends have contributed to a gradual replacement of rigid pack formats by flexible packaging during the last decade or so. This trend is outlined in Smithers Pira’s new report – The Future of Flexible Packaging to 2022 – which values total flexible packaging sales at $219.5 billion in 2016 and forecasts growth at an annual rate of 4.3% to $282.6 billion by 2022. Why Are Shrink Sleeves So Special In Marketing? One of the most important things that will make any marketing strategy successful is having a robust product promotion and advertising plan in place. A well-designed marketing and promotional strategy will be successful in putting across the benefits of your product or service to the customers to ensure long-term success, bring in more customers and ensure profitability for businesses. In addition to having a unique product and employing the use of various platforms, including social media, television, or shopping outlets, one tried and tested way that your brand will garner the attention of the pre-occupied customers is by having an eye-catching packaging for your product. You may have an utterly unique product, but there is no way to communicate that if there’s nothing to distinguish your merchandise from that of your competitors. Next to brand loyalty and ingredient preference, labeling and packaging plays a big part of a customer’s purchasing decision. And even if they don’t buy it, your product will still get a lot of attention if the design is interesting and attractive, if it has both impressive form and function, and if it is uniquely relevant to your target market. The one thing that most products have in common today is shrink sleeve labeling and with good reason. Compared to older forms of labeling that were bulky-looking and only used to barrage consumers with product information, shrink sleeve labeling has become very special and prevalent in marketing not only for its ability to conform to any container shape, but also because it provides printed label graphics and content over a larger area of the full container. Older forms of labeling were also quite susceptible to damage, especially because they couldn’t withstand moisture, wet conditions, and constant handling by customers or during transportation. Not only does shrink sleeve labeling make a product look clean and sleek, but the tamper-evident band that fits securely around the lid, neck or cap of the container provide visual evidence of label removal attempts. Your products are most-likely to be handled many times over after being packaged and keeping them safe is a priority for brand longevity plus you build consumer loyalty because you are showing a clear concern for their well-being by using tamper-evident in your packaging. In addition to incorporating a clear tamper assurance band, the 360-degree artwork on shrink sleeve designs are quite elegant; they certainly will add a visual interest to your product and set it apart from others in your line of business. Depending on your budget and the impression you want to make in the market, you have a choice of different varieties of shrink labels. Some will cover multiple containers for the purpose of offering them as one product, others, such as full-body shrink sleeves create a 360-degree graphics coverage of your product from top-to-bottom, and finally, a standard sleeve will cover a portion of the container to allow for product visibility. Do any of these shrink sleeve labeling options appeal to you? As sustainable and recyclable packaging is becoming an increasingly important topic in the market for flexible packaging for both brand owners and end users, the plastics and packaging industries are looking for ways to ultimately move to monomaterial structure to facilitate recycling. Current structures cannot be recycled because of the use of mixed polymers in the structure, such as barrier or printed substrates/films typically involving PET laminated to sealant substrates consisting of PE, OPP or CPP dependent upon the application. To deliver a full PE barrier laminate structure is not easy as the mechanical properties of PE are not optimised for web transportation, stability and conversion and the heat sensitivity of the film also creates additional challenges when using vacuum deposited barrier layers. The Full PE Laminate solution by Borealis and Borouge is a step-change concept in flexible plastic packaging. It is based on the proprietary Borstar® Bimodal Polyethylene (PE) Technology in combination with machine direction oriented (MDO) processing technology. Packaging solutions of The Full PE Laminate are as efficient in terms of performance as other flexible packaging structures and serve as 100 percent substitutes for multi-material film solutions in pouches and packs. Most compellingly, the recyclate gained from The Full PE Laminate packs can be used for valuable end products with no loss in efficiency, and can even be used to produce PE film products. Shrink sleeve labeling is becoming more and more popular within the industry. Rather than traditional sticker type label options, shrink sleeve labeling offers full color graphics that wrap around the entire bottle. This type of shrink sleeve design can make your packaging stand out. You are only limited by the size and shape of the bottle. You can differentiate your package with shrink sleeve labels. Shrink sleeve labels fit over complex containers so you’re not limited by one shape. They serve the purpose of being a label, as well as provide a safety seal and a promotional tool. These shrink sleeve labels are carefully measured and then applied to the plastic bottle through a heat-shrinking process. This process makes them wrap around the bottle. Shrink sleeve designs are for more than just plastic bottles, shrink sleeve labeling can also be done for glass and metal containers as well. Shrink sleeve labels work on a wide range of containers within a multitude of industries. They can be placed on food and beverage bottles, or personal care products such as shampoo, lotion, or sunscreen. They can be used for household products such as cleansers and cleaners. They also work well on pharmaceutical or nutritional products. The shrink sleeve design will nicely wrap around the bottle and provide a 360 degree full wrap feature. They can conform to all shapes and sizes of containers, with the ability to utilize the entire space. They can also be used for other types of promotional designs. They can be used to create bonus packs or to attach samples or other types of incentives to your containers. Creating combination packs will help you to increase your sales and reduce any slow moving inventory you may have. Shrink sleeve labeling can also wrap around the cap of your bottles. This is done with a perforated tamper evidence wrap. You can choose to match the sleeve or use a different color, such as clear, white, black, or metallic. This will give a secure appearance to your products and provide assurance to buyers that the product is fresh. It also serves a dual purpose in that it protects your children from easily opening containers, and keeps them from ingesting unsafe products. Shrink sleeve labels can easily be customized to your products. During the process, it’s also easy to adjust, should there be something you don’t like. These items are printed with the latest and best high-quality offset technology. To get started, you’ll create your designs, and then customize them. You will then select your film substrate. Your order can be adjusted by changing your graphics to fit the bottle until you are satisfied. Our shrink sleeve labels can be ordered in any quantity to suit your ordering needs. We also keep graphics on file. We provide one-off test samples so you can see how this packaging can work for your business. Where is the packaging industry heading? This trend is outlined in Smithers Pira’s new report The Future of Flexible Packaging to 2022, which values total flexible packaging sales at US$219.5bn in 2016 and forecasts growth at an annual rate of 4.3 per cent to US$282.6bn by 2022. An increasingly urban society is leading to busy lifestyles in which time-constrained consumers choose products that offer convenience and portability. Demand is rising for microwaveable packaging, single-serve packs, carry-away packs, resealable packaging, easy-open packs and longer shelf lives. More eating away from home and on-the-go consumption suggests that more packaging will need to be designed for portability and less weight and resealability will need to be designed for products eaten at home. For the packaging converter and its logistics chain, flexible packaging uses fewer resources and less energy than other forms of packaging. It provides significant reductions in packaging costs, materials use and transport costs. Furthermore, it can also be constructed on the spot from roll materials at the filling location, minimising transportation of ready-formed empty packaging. To the consumer, it takes up less space when empty than rigid packaging. Supermarkets are becoming especially favoured by consumers due to their wide product ranges and diverse choice of premium brands, usually unavailable in other types of outlets. There has also been growth in the number of discount stores and private label products, which enables those on lower incomes to purchase packaged food and drinks at more affordable prices. Pouches, and particularly stand-up pouches, are the fastest-growing product category within flexible packaging. The new generation of vertical form-fill systems (VFFS) is capable of delivering faster production speeds, greater versatility and improved sealing techniques. In the current economic climate, there is a growing need to reduce the time to market for even the most basic commodity items, a trend that is placing pressure on packer fillers to meet increasingly tight delivery schedules cost effectively.